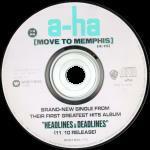 "Move To Memphis" was recorded especially for inclusion on and to promote the "Headlines And Deadlines"-album. The tune was produced by a-ha and is different from the version later to be included on the "Memorial Beach"-album. The 7" picture sleeve offers a black and white band-shot (Morten, Pål and Mags) by Just Loomis. 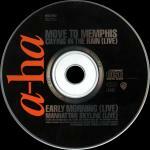 A white a-ha logo is placed in the upper left corner with "Move To Memphis" printed in orange capital letters right below it. The reverse features track listings and additional information in light blue, orange and white letters of various sizes in the top left corner of an otherwise black sleeve. In addition to the self-produced single (4:15) the flip contains a live version of "Crying In The Rain" (4:46) recorded especially for the NRK (The Norwegian Broadcasting Corporation)-produced show "ÿsten For Sol Vesten For M&ahat;ne" (East Of The Sun West Of The Moon). 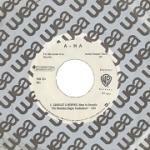 There is also a Special DJ Edit promo 7" which features an edit version of "Move To Memphis" (4:03). The sleeve appears almost identical to the regular edition, although some copies have a white sticker with date stamp on the front (16 OCT 1991) and "Special DJ Edit" sticker on the reverse. The disc stickers are the same as the regular release and list the track time of "Move To Memphis" as 4:15, but the running time is actually only 4:03. The disc itself has the catalogue number "W0070 DJ" etched into it. The 12" is identical to the 7"-release concerning the front of the sleeve. The reverse features the necessary adjustments made for the additional tracks. These include the "Extended Version" of "Move To Memphis" (6:09) and live versions of "I've Been Losing You" (4:57), "East Of The Sun" (4:11) and "(Seemingly) Nonstop July" (3:00) recorded live for the Norwegian Broadcasting Corporation (NRK). The 5"CD has front cover like the 7" and the reverse of the insert is similar to the back of the 7" but without the large "A Side" and "B Side". The spine is white with titles written in orange and black. The CD is black with silver titles and an orange a-ha-logo. The three live tracks on the CD were again recorded live for the Norwegian broadcasting corporation (NRK) and include, in addition to the tracks of the 7" single, "Early Morning" (3:04) and "Manhattan Skyline" (7:08). There is also a 4-track promo 5" CD which features the "Radio Edit" of "Move To Memphis" (4:03) [similar to the regular version, but with the part between 2:49 and 3:01 edited out]. It doesn't come with a picture sleeve. The disc is similar to the regular release, but has "For promotional use only" printed below the track list. The unique catalogue number "SAM 917" is printed at the top of the disc. The cassette single has cover design very similar to the 7". The flap of the insert opens up, it is black with the titles in blue white and orange. 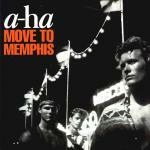 The spine is white with black a-ha-logo and orange "Move To Memphis"-titles. The cassette is white with black titles and plays the same on both sides. This promo only cassette single doesn't come with a sleeve. There is a white sticker on both sides of the cassette with the titles printed in black letters. 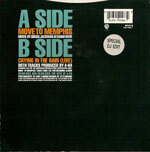 Side 1 features the single version of "Move To Memphis" (4:15) while side 2 has the extended version (6:39). 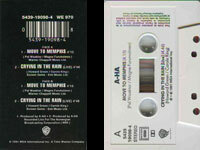 Australian: A cassette single of " Move To Memphis" was available in Australia. It comes in a picture card sleeve (rather than a plastic case with insert) which is of similar design to the UK single. The cassette is transparent with white text and blue cogs. It plays the same on both sides. 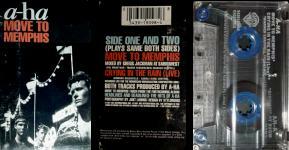 France: There is a French "2 titres" cassette single of "Move To Memphis" which comes in a card slip sleeve. The back of the sleeve is black with the titles printed in white. The cassette is white with black text. The cassette is housed in a white long box card sleeve with "2 titres Cassette Single" printed in white and blue letters at the top. Japan: The 3" CD (released November 1991) snap-pack features a black sleeve where the top half is similar to the UK release. The bottom half has yellow, red and blue Japanese text plus a white a-ha-logo and blue titles. The reverse of the snap-pack is white with black text which includes the lyrics in English and Japanese plus a tiny black and white picture of the "Headlines And Deadlines" album. The CD is silver coloured with red WB-logo and black titles. There exists a Japanese 1-track promo 5" CD of "Move To Memphis" which features the 4:15 album version. The disc is white with light blue a-ha-logo plus silver titles. Mexico: There is a Mexican promo 7" with title "Cambiate A Memphis". It comes in a wea print sleeve. 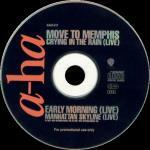 USA: There is a U.S. promo cassette single of "Move To Memphis", details to be confirmed. USA? promo Move To Memphis / Move To Memphis (Extended Version)? ?